SPACEX BLASTED OFF a secretive US government payload, known only as NROL-76, marking the first military launch for the California-based aerospace company headed by billionaire tycoon Elon Musk. The payload for the National Reconnaissance Office, which makes and operates spy satellites for the United States, soared into the sky atop a Falcon 9 rocket this morning, local time. “And we have touchdown,” a SpaceX commentator said on the live webcast of the event as cheers broke out at mission control. The first stage has landed back at Landing Zone 1. Another good day for us at SpaceX. A beautiful sight to see. The larger, first stage, made a gentle arc and powered its nitrogen thrusters to guide it back to Earth. The rocket then set itself down, gently and steadily, in the center of the 300-foot (91-meter) circular landing zone. SpaceX has already made multiple successful landings, some on floating platforms — known as drone ships — in the ocean. 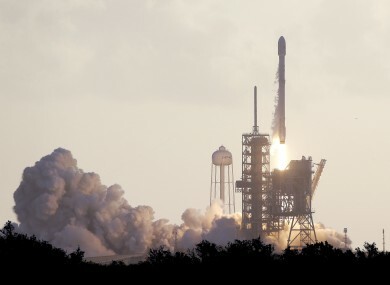 The launch was initially planned for yesterday, but was postponed in the last seconds before liftoff due to a sensor issue with the rocket, SpaceX said. The sensor in question was replaced ahead of today’s attempt. Little was known about the payload due to its classified nature. “As a matter of policy and because of classification, NRO does not provide information about our contracts,” a spokeswoman said. SpaceX to was selected to launch NROL-76 “after a competition”, said the NRO spokeswoman. Email “Watch Elon Musk's SpaceX launch and then land its first rocket for the US military”. Feedback on “Watch Elon Musk's SpaceX launch and then land its first rocket for the US military”.